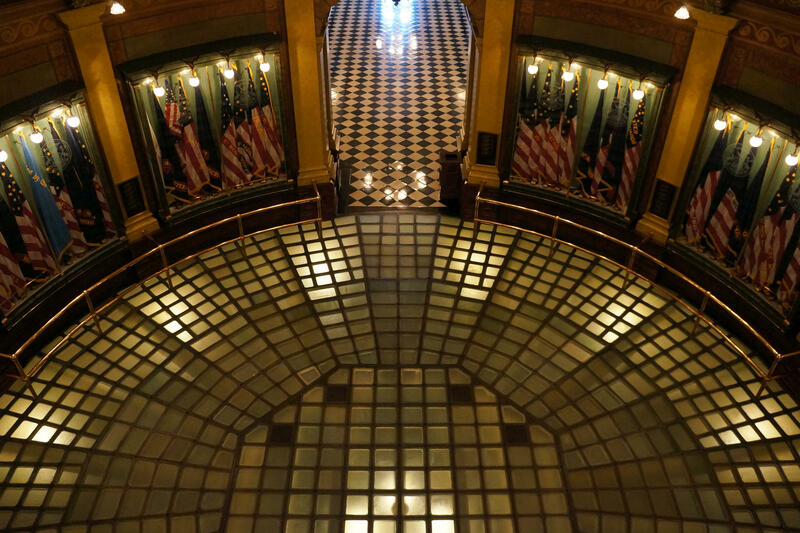 Republicans move bills to limit the power of Michigan’s Attorney General and Secretary of State, as Democrats prepare to serve in those offices. Arcadia Brewing’s Kalamazoo location faces foreclosure. Marijuana is now legal in Michigan. (MPRN) The state Senate has approved a plan that would allow for the construction of a section of new pipeline inside a tunnel to send crude oil and natural gas liquids under the Straits of Mackinac. Governor Rick Snyder recently announced a deal with Enbridge Energy to shut down part of the decades old Line 5 and replace it with the new section of pipeline inside a tunnel. The Legislature needs to approve oversight of the tunnel – and that’s what this bill does. It creates a three-person commission appointed by Governor Rick Snyder. Environmental groups say the tunnel plan is not a safe solution for the Great Lakes. They want to shut down Line 5 altogether. (MPRN) The state House has approved a fiercely debated bill that would allow the Legislature to intervene in court proceedings. The bill passed 58 to 50 with some Republicans voting against the measure. Before the vote many Democrats expressed their disdain for the bill. They say it’s a power grab meant to hamper the incoming Attorney General Democrat Dana Nessel. The bill now goes to the state Senate. (MPRN) Republicans in Lansing are moving forward on efforts to shape a ballot initiative that passed during the midterm elections. Proposal 3 made numerous changes to Michigan’s election laws – changes supporters say will make voting easier and more accessible. But lawmakers say there were holes in the proposal and details that need to be ironed out so it can be implemented. The main problem opponents have with the bills is that they say they’re moving too quickly and without sufficient time to review the legislation. They say there’s plenty of time to make any clarifications to the measure next year. (MPRN) Republicans in Lansing want to take away some of the Secretary of State’s oversight powers. A state Senate committee passed multiple bills yesterday. They would create a commission to oversee campaign finance matters – instead of the state’s top elections official. Supporters balk at accusations that this is an attempt to strip power from the incoming, Democratic, Secretary of State. They say this commission is modeled after the Federal Elections Commission. (MPRN) Legislation that would add definitions and create penalties in the state’s new voter initiated redistricting law made its way through the state Senate Wednesday. Voters passed a measure to create an independent redistricting commission in November. Now lawmakers say there are clarifications that need to be made. Republican Senator Phil Pavlov who sponsored the bill says these are not major changes. Opponents say the Legislature should not pass any legislation that impacts the redistricting proposal. They say a lame duck session isn’t enough time to get it right – and it should be left up to the next Legislature. (MPRN) The state Senate has approved a bill that could make it difficult for state regulators to set stricter limits on PFAS contaminants in drinking water. The bill would prevent state agencies from making new rules that are stricter than federal standards. That would not apply to rules made to deal with an emergency. The state House still needs to approve changes made in the Senate. Governor Rick Snyder vetoed a similar bill in 2011 saying it would make it too difficult for the state to protect the environment. (MPRN) Lawmakers in Lansing want to make public employee unions vote on their bargaining representatives every two years. A bill that would require this to start in 2022 passed a Senate committee yesterday. It’s a move that union groups say would cause “chaos”. Senator Arlan Meekhof is the bill’s sponsor. He says this would just treat unions the same as private companies. (Kalamazoo Gazette) Kalamazoo County Sheriff Rick Fuller says the county's jail won't hold people sought by federal immigration agents after their sentences are done. But the Kalamazoo Gazette says a new policy will inform federal agencies when those prisoners will be released. Immigration rights groups have been pressuring Fuller not to honor so-called "ICE detainers." Fuller says his department will maintain what he calls "professional relationships" with federal agencies. (Michigan Radio) Starting Thursday marijuana is legal for anyone over the age of 21 in Michigan. The ballot proposal passed by voters last month takes effect Thursday, but there are restrictions. Possession of up to 2.5 ounces of cannabis is legal, but selling remains illegal. However, you can give it away if you wish. Adult use is restricted to private dwellings. (Kalamazoo Gazette) One of Kalamazoo's biggest brewpubs could go on the auction block later this month. The Kalamazoo Gazette says a bank wants to foreclose on Arcadia Brewing for failing to make mortgage payments. In a statement Wednesday, Arcadia founder Tim Suprise says the company is - in his words - "in transition." But Suprise says it's in a process to maintain a presence in Kalamazoo. Kalamazoo County Treasurer Mary Balkema says the company also has unpaid property taxes.